Some villages and streets are named after a 不動堂 Fudo Hall in the neighbourhood. Kyoto, Miyagi, Chiba . . .
. Kyoto- hana no miyako 花の都 . 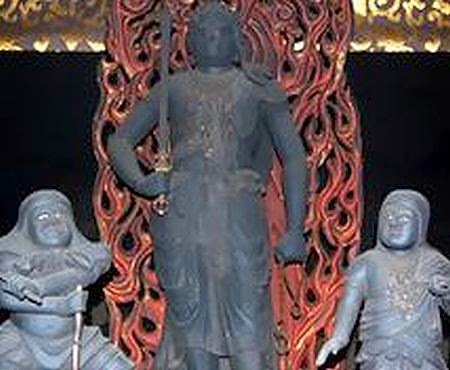 (Kita Fudodo-cho, Minami Fudodo-cho, Higashi Aburanokoji-cho, and Nishi Aburanokoji-cho). (Fudo No Do . 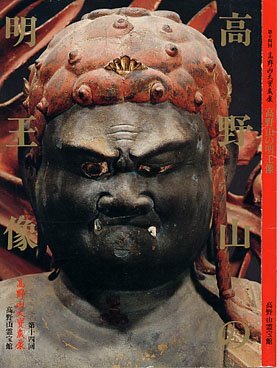 . . fudondo) 不動堂 Fudo Do. 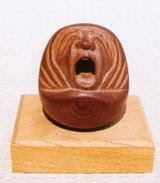 The Fudo Hall is in the compound of an Inari shrine 稲荷社. It was founded on behalf of Emperor Uda Tenno. 不動堂（ふどうどう）稲荷社の南にあり Fudo-Do hall is South of the Inari Shrine. The statue is burried deep in the ground and only a "maedachi" copy is to be seen. In 823 Kobo Daishi Kukai built the temple Tooji 東寺 To-Ji and this Fudo Hall is in the un-auspicious North-Eastern direction of the Kimon 鬼門. 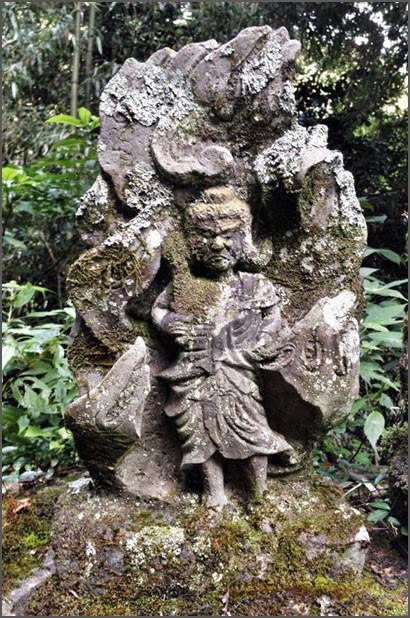 Kukai found a stone tablet in the ground and engraved Fudo Myo-O onto it. The tablet was then saved in a stone casket and sunk deep into the well to protect it from the eyes of normal people. The temple has been protected by 宇多天皇 Uda Tenno (867 - 931). In 899 He ordered the well to be shut for the public and gave it the name. Special rituals are performed at this well and the temple. 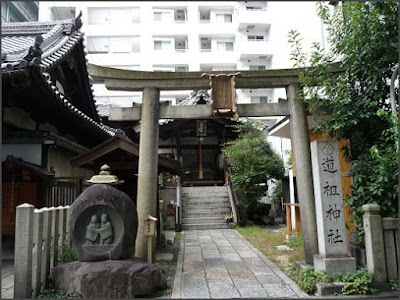 During the uproars in the Muromachi Period (Onin no ran 応仁の乱 1467) the temple building was lost to fire, but the stone Fudo in the well remained. The present-day hall was built in 1764.
was the 59th emperor of Japan, according to the traditional order of succession. 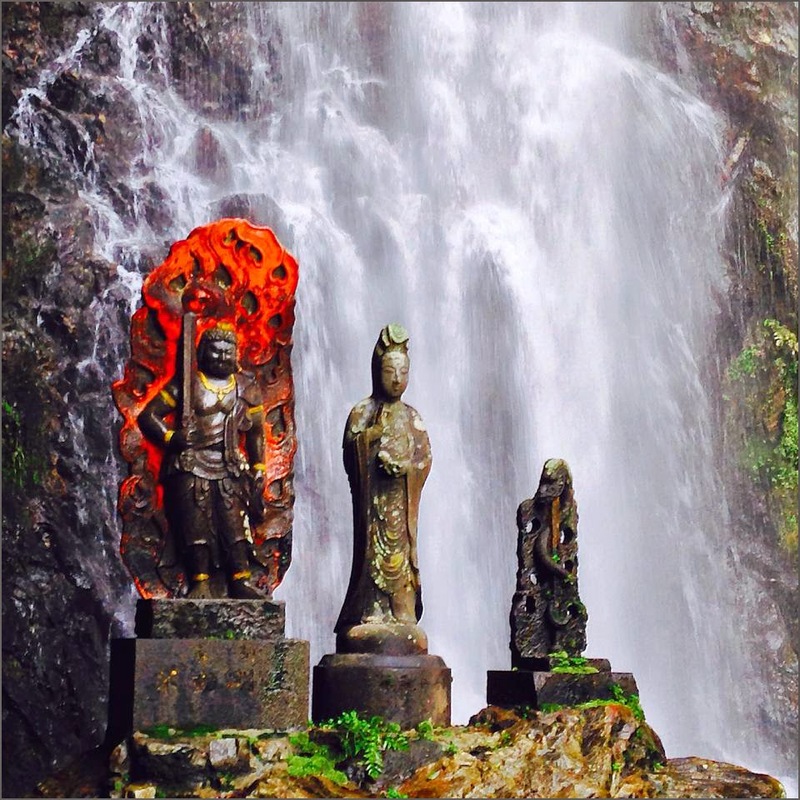 Uda's reign spanned the years from 887 through 897.
is usually placed between streets and villages, hence this deity’s function is protection during travel and helping to avoid evil spirits. Doso Jinja Shrine was rebuilt during the era of Toyotomi　Hideyoshi (late 16th century), but originally it has a quite a long history. Here enshrines Sarutahiko no Mikoto, deity for travel and　Ama　no　Uzume　no　Mikoto, deity for entertainment. They’re a married couple deities, therefore, they have been worshiped for successful matchmaking and marital harmony. 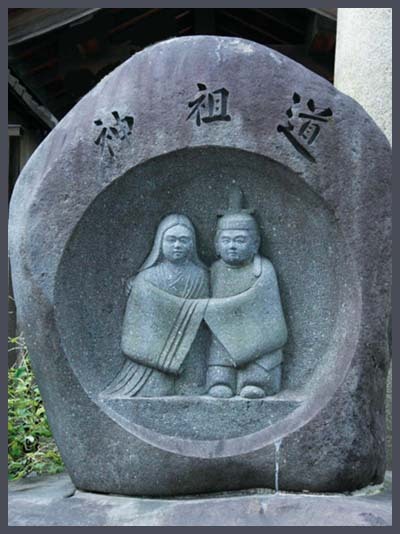 “Two figures Doso-shin”, there are many Doso-shin statues, but here is a couple statue of a man and a woman snuggled against each other, who are wearing the clothes of Heian period in front of the gate. It is a small shrine located between the buildings near Kyoto Station. 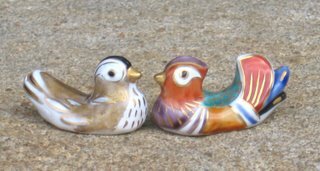 Here you can see a harmonious couple and it makes people smile when they see it. The benefit of this shrine is for matchmaking, but if you visit with your partner, you can receive a blessing for a long and happy marriage life.
. 道祖神 Dosojin - Introduction .
. 道祖神 Legends about Wayside Gods .
. Shinsengumi 新選組 - Introduction . 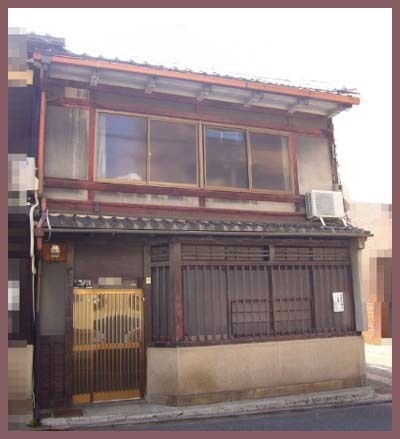 a machiya town house in the Fudocho district. 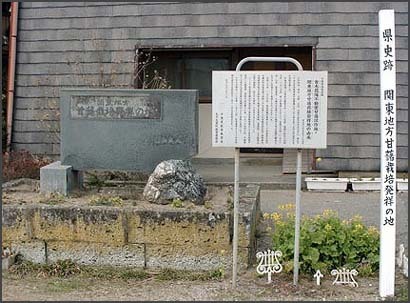 It used to be Fudo-Do village 不動堂村 since 1889. 現在の美里町の小牛田駅周辺にあたる。 Now part of Misato Machi, 小牛田町 Gogota Cho. Fudodo Village in Yamabe County of Kazusa Province (present Kujukuri-cho, Sanbu-gun, Chiba Prefecture). Memorial stone at the place where he planted the first sweet potatoes.
. "Doctor Sweet Potato", 'Master Sweet Potato' - Introduction . 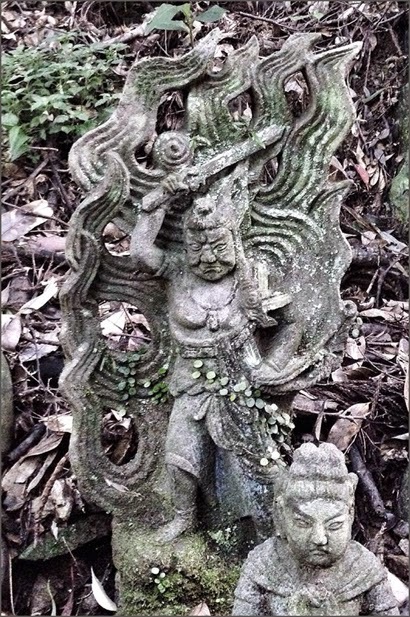 This Fudo has lost his sword. The Shomudo hermitage was founded in 2005 in the Alps in France by the Venerable Kûban Jakkôin (Sylvain Guintard), as a place of ascetic practices, a place of worship and also a home from which to broadcast the teachings of the Shugendo in the West. The hermitage of the Precious Immovable Saint (Fudo Myoo) SHOMUDO-AN was founded following the long coma of Venerable Kuban, as a sign of thanks towards the Saint Founder of Shugendo (Enno Gyoja) and of various divinities of esoteric Buddhism. 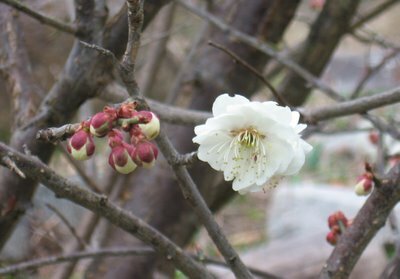 The hermitage is following the miscalenious Tradition of HONZAN-SHUGEN-SHÛ congregation, the shugen Path of the Original Mountain! The head-quarter temple the Imperial temple SHOGOIN-MONZEKI in Kyoto. 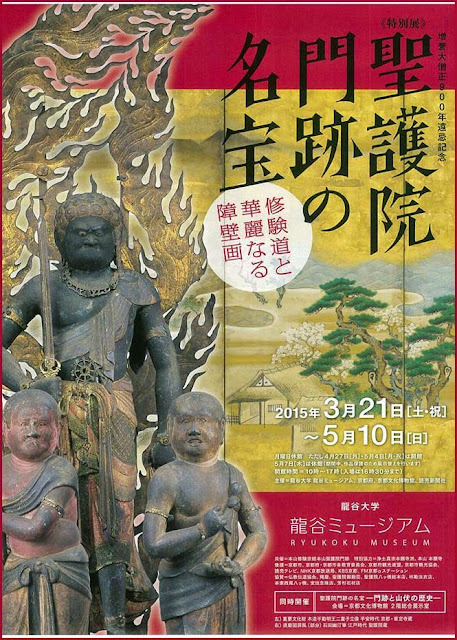 The principal deities of the hermitage are: DAINICHI NYORAI (the Buddha Maha-Vairocana); Karasawa "Sho-no-Iwaya" FUDO MYOO (the Vidyaraja Acalanantha of the cave of the celestial flute); the divine avatar IZUNA DAIGONGEN, MIROKU BOSATSU (bodhisattva Maitreya); JIMPEN DAIBOSATSU (Enno Gyoja's posthume name); SHUGYO DAISHI (master of ascetic pratices, Enno gyoja during his ascetic periode at Mt Sanjo), Senju Kannon, Akiba Daigongen, Monju Bosatsu, Fugen Bosatsu, Kongosattva, Hachiman Daibosatsu and the great Tengu. 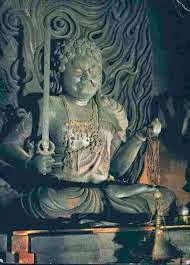 Three of its divinities are of the "Secret Buddhas" (hibutsu) of Japan: JIMPEN DAIBOSATSU (the great bodhisattva of metamorphic transformation) main Deity of the imperial temple Shogoin in Kyoto; SHUGYO DAISHI (the great master of asceticism) of the monastery of Mount Sanjo in the Mt Omine of Japan and the very secret IZUNA DAIGONGEN: the protective divinity prayed to by General Takeda Shingen (at the time of the feudal wars in Japan, 500 years ago) and also by the majority of the native ninjas of Mount Togakushi. 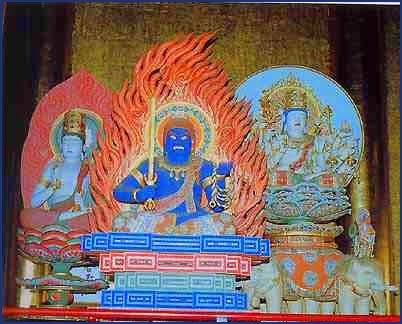 Cental altar deity is MIROKU Bosatsu, Maitreya bodhisttava. 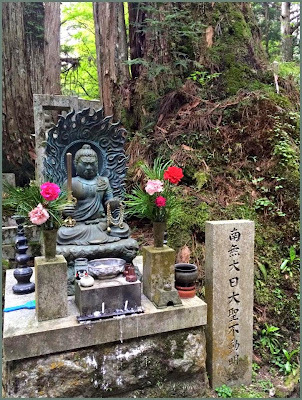 Nearby is the forest 聖護院の森 Shogo-In no Mori, where a love-suicide took place in 1744. Now also a topic for Kabuki. ... Shogoin-Monzeki Temple ... The town around the temple looked different from usual. It looked crowded and the booths of the Yatsuhashi Japanese sweets lined. Junteido Temple, one of the sub-temples of Shogoin-Monzeki has an annual event called Godairiki-san which is worship for five bosatsu Buddha statues on February 23rd. You can see a little different costume from the usual monk’s one at this temple. 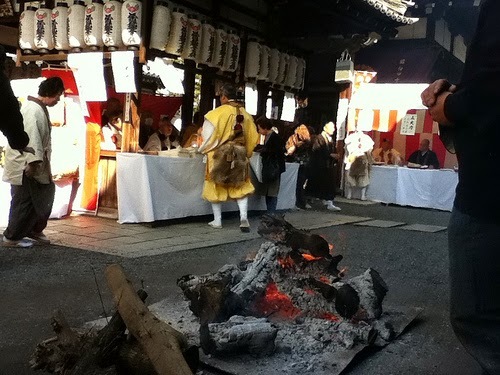 The costumed people are called Yamabushi, who walk, walk and strive for training in the mountain. This is one of the Buddhism training. They usually dangle the triton from their waist. Shogoin-Monzeki Temple is the head temple of Yamabushi worship. On this day, free kasujiru miso soup with sake is served. You can enjoy an unique winter event and be warm up! 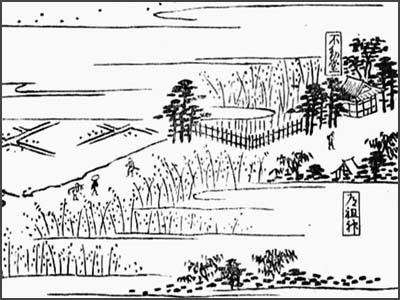 Yatsuhashi refers to 八橋検校 Yatsuhashi Kengyo (1614 - 1685). The hard bisquit has the form of a koto instrument.
. 智證大師 Chisho Daishi Enchin Enchin 圓珍 - 円珍 . (1614–1685) was a Japanese musician and composer from Kyoto. 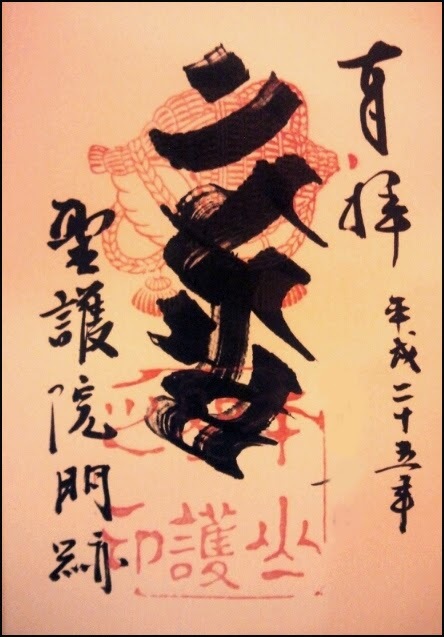 The name Kengyō is an honorary title given to highly skilled blind musicians. Yatsuhashi, who was born and died in Japan, was originally a player of the shamisen, but later learned the koto from a musician of the Japanese court. Originally restricted to the court, Yatsuhashi is credited as the first musician to introduce and teach the koto to general audiences. He is thus known as the "Father of Modern Koto." He changed the limited selection of six pieces to a brand new style of koto music which he called kumi uta. Yatsuhashi changed the Tsukushi goto tunings, which were based on tunings used in gagaku, and with this change a new style of koto was born. He adapted the Hirajoshi scale and the Insen scale for the koto, from the shamisen repertoire. Yatsuhashi is also credited as the composer of the important koto solo piece Rokudan-no-shirabe (六段の調, Music of Six Steps), although he may not actually have composed it himself.
. Iris and the Yatsuhashi bridge - . 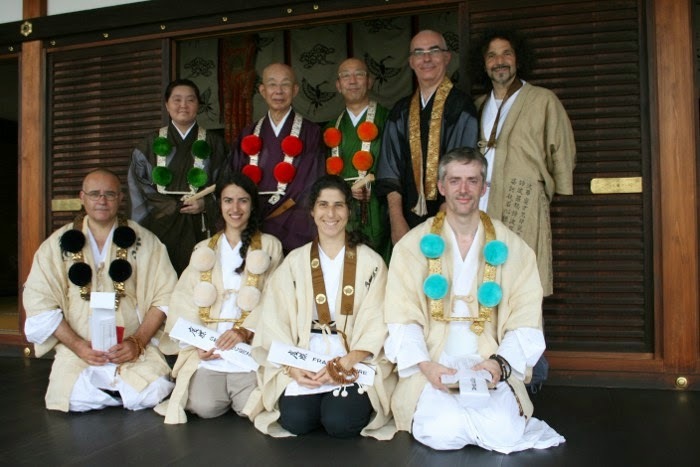 The 18 Head Temples of Shingon School have a very long history. 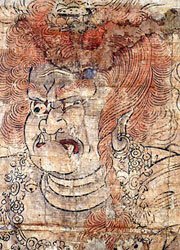 Kobo Daishi (Kukai) established most of these Temples to train his disciples and Shingon priests. Some Temples were built to conduct prayer services for the country and its people to create peace and harmony. Numerous Emperors became priests after they retired their thrones and became the head of these Temples in Kyoto. Each of these 18 Temples represents a profound teaching of the Shingon tradition. By visiting them, we open to the opportunity of understanding these teachings and implementing them into our practice and our daily lives. The 18 Temples are located in Kansai, the western region, Japan and stand within a 1,360 kilometers stretch (850 miles). 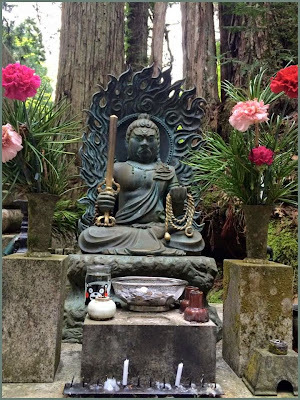 Eight Temples are in Kyoto, 4 in Nara, 3 in Hyogo, 2 in Wakayama and 1 in Kagawa Prefecture. It takes 50 days by foot and at least 5 days by bus. No. 2 SUMADERA TEMPLE . 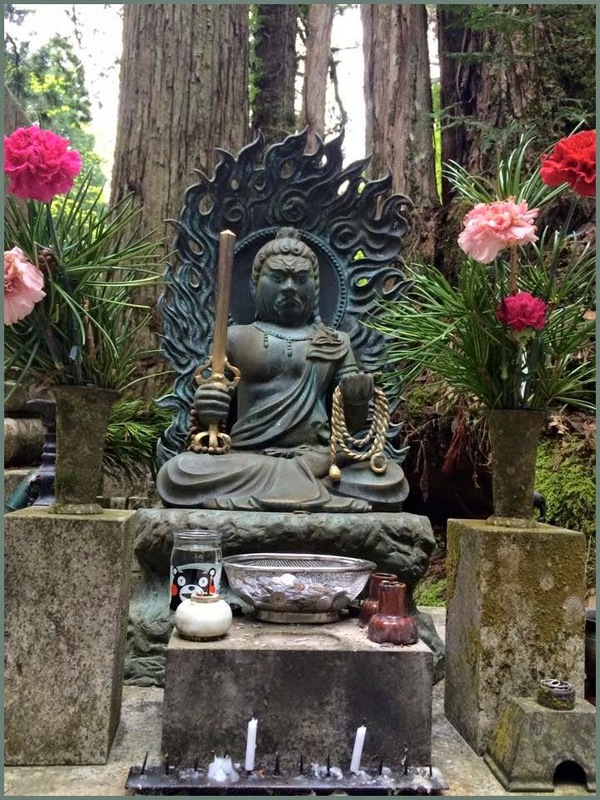 Sumadera 須磨寺 . Read the Details HERE ! No. 13 . Hōzan-ji 宝山寺 / 寳山寺 Hozan-Ji . This temple is officially located in Nara, but many people from Osaka come here to pray and enjoy the vista too. 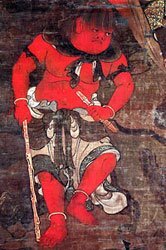 with Kongosatta to his right and Fugen Enmei Bosatsu to his left on the eastern side of the altar in the Kondo 金堂 on Koyasan 高野山. These are reproductions as the originals from the Heian Era were lost in a fire in the mid-1920s. 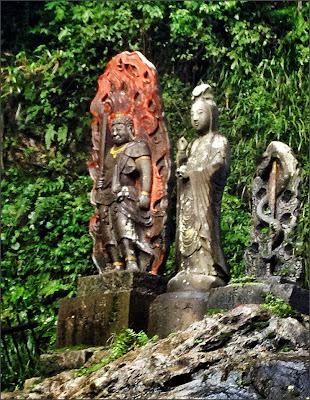 The main statue is secret and only shown once a year on June 28. 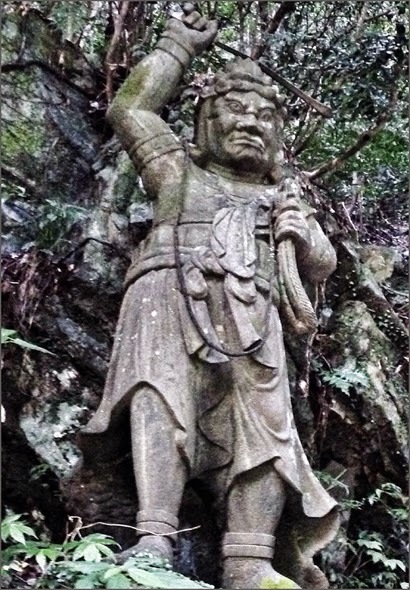 The statue was carved by Kobo Daishi Kukai himself when he was in China. On his way home, when his ship encountered a severe storm, he threw the statue in the waves with the wish to apease the storm and the waves. Soon the waves became quiet and he came back safely to Japan.
. Hibutsu 秘仏 secret statues of Fudo Myo-O .